Count hits to your web pages in a stylish way - this is a standalone Stack that does not require registration on any site. 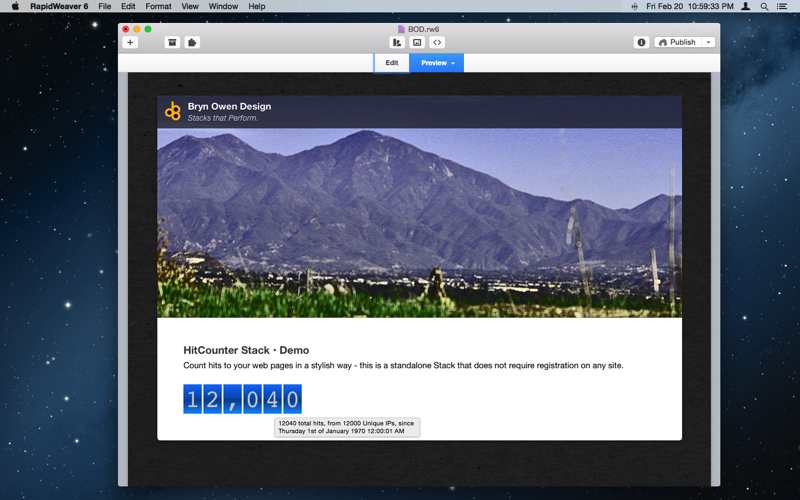 Add a hit counter to your page and easily configure it to count every page hit/refresh, or only hits from unique IP addresses, or filter out repeated hits from the same user in a specified range of time. You can have individual page counters or set each one to share its count sitewide. Choose from a variety of styling options or make your counter invisible as a comment in your HTML (you can still check your hit count by viewing source)! A new feature allows you to show the hit count on other pages, to create a summary page showing hit counts across your site. PHP is used to track and time page hits from IP addresses. 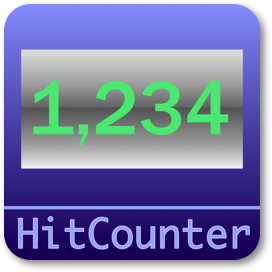 HitCounter options allow you to configure the kind of hit counting you prefer, and the appearance of the count on your web page. There are several parameters to control the size and coloring of the counter so you have all the flexibility you need. You can now filter out your own IP address, or several, from counting toward hits. Page/Site count You may keep counts for each page separately by adding a HitCounter Stack to each page and using the Per Page option here, or you may set this Stack to share its count with all other HitCounter Stacks on your site so that they all contribute towards a Shared Sitewide count. This changes the counter database file from your page location to the webroot location. Hit counting Select how to count hits: Every Hit = increase the count every time the page is loaded or refreshed by anyone; Hits in Time = increase count only for unique IP addresses spaced apart by an elapsed time (so successive hits close together by the same person do not count); Unique IPs = each person increases the count only once, no matter how many times they revisit your page over time. Elapsed time For timed visits, wait this long between hits from the same user before increasing the count. The result is that frequent visits by the same user are not counted, but if they revisit your site after a long time has passed, it counts. This is useful for preventing counts from the same user over a short duration of time as well, as is the case when they are browsing your site over the course of several hours, or leave it on their browser for several days. Starting count Add this value to your page count. Useful when changing from another service to this Stack: you can bring your old page count over. Set to 0 or blank to ignore this. Show count from page ... Show (but do NOT increment) the hit count from a HitCounter on any page, selected using the link below. You may use this option to: have a passive hit counter that displays this page count but does not affect it, or create a summary page of HitCounters from all over your site. This option disables incrementing the counter, and only shows the hit count without affecting it. Show from page Point to a page whose HitCounter you wish to display here. You must duplicate the settings of that other HitCounter that set the Page/site and Hit counting methods, and the Counter file, otherwise the count shown here may differ from the value shown on the other page. Invisible! Enable this option to hide the counter, but continue counting. The count is added to the HTML as a comment only. The styling options below are ignored when this option is enabled! Text font Choose a font for the counter text, or select Other and provide your own font. Other font Select another font to use for the counter text. Text size Set this to any value in pixels or em such as 24px or 1.5em. A value of 1.0em is nominal text size and is the same as leaving this blank. Text color Counter text color. Bold text Bold the counter text. Digit padding Add spacing between digits. Padding t/b Add top and bottom padding. Align Align the counter within the div. Background Choose the type of background gradient for coloring, or transparent (color options are not used). Main color Main background color. Gradient color Second background color for linear gradient effect. Rounding Round the background edges of each digit. The effect can become uneven for large values when the Divider width option is used to create a gap between digits (actually a one-sided border). Divider width Add vertical bars between digits to simulate a mechanical counter. Set this to 0 to hide these bars. If transparent, then these simply act as spacing between and optionally around digits. Divider color Color of vertical bars between digits if used. Add surrounding border Add a border around the counter matching the vertical bars between digits. Add right border Add a border on the right matching the vertical bars between digits, to make them appear as shadows of the digits. Useful when rounding is enabled. 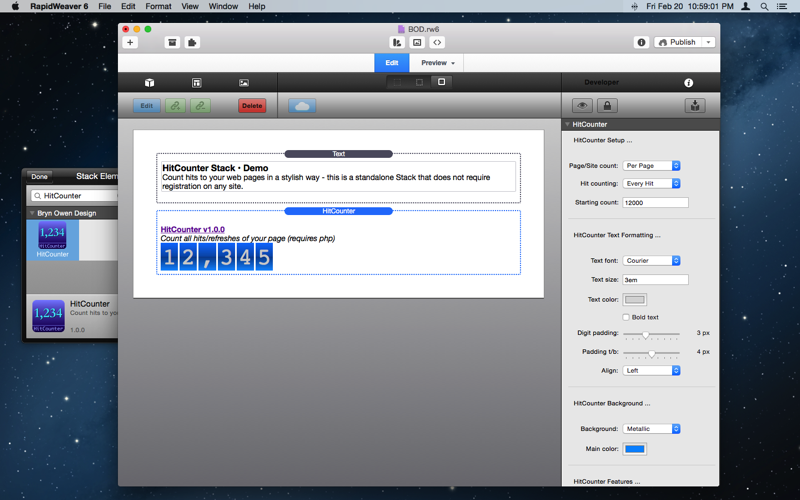 Enable hover details Check this to add detailed count information to the digits that can be seen when hovering the mouse. Thousands Choose the type of thousands/millions separator to use between digits, or None to disable this. Ignore IP addrs Create an optional list of one or more complete IP addresses to ignore so visits from these clients will not affect your count. The list is addresses separated by space and/or comma, and each IP address should be in the form of nnn.nnn.nnn.nnn where nnn is a 1, 2, or 3 digit number in the range 0..255. Eg: 64.12.2.4, 64.12.2.5, 199.128.70.1. You can google instructions on how to find your own IP address.